When the manual mode is on, you can use the rotary knob to adjust the detection sensitivity. The low-sensitivity mode can more accurately determine field conditions in complex lines. In the high-sensitivity mode, the condition of walls and hidden lines can be detected. The buzzer will generate a slow-to-fast-phase alarm. LED light design makes it work even under dark evironment. It is an ideal tool for electiric worker. 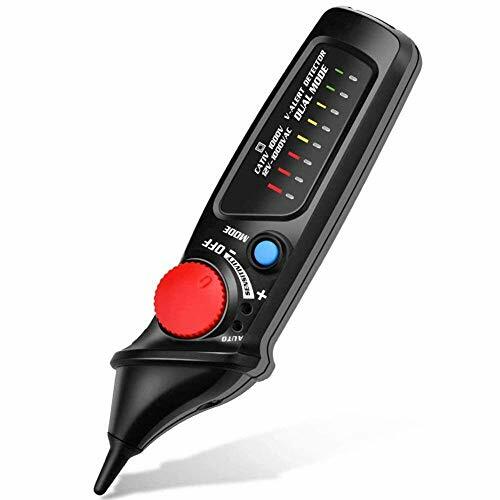 The volt tester is complied with the CE CAT III 1000V/ CAT IV 600V, and it is also equipped with an audible and visual alarm to guard your safety.